Recently, in the SIG Sauer Fans Facebook Group, we had a discussion about grips and trigger bar springs on the original classic West German SIG Sauer P226. 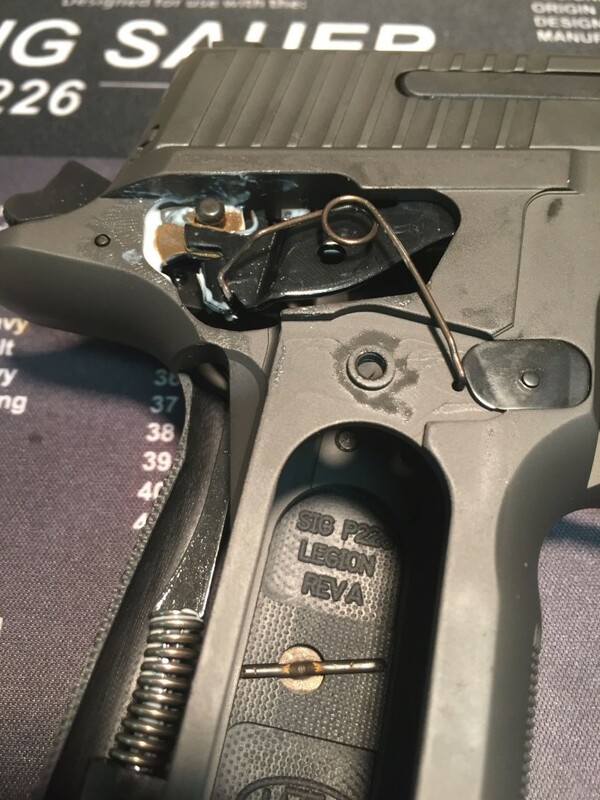 So I thought it might be helpful to explain exactly why you can’t use the original plastic West German P226 grips on a pistol using the later-style “looped” trigger bar spring. I’ve previously mentioned this issue in a separate article on differences between the original West German P226 and the P226 Legion, but because it can cause a major malfunction in your gun, it’s an important enough issue that it deserves its own article. What is the Trigger Bar Spring? In a SIG Sauer P-Series pistol like the P226, the trigger bar spring resides under the right-side grip, near the top rear of the frame. It provides spring tension to the trigger bar, and one of its main functions is to push the trigger bar forward to reset the trigger after a shot. Why was the P226 Trigger Bar Spring Design Changed? The original “bent” style trigger bar spring still works just fine. 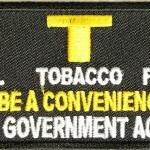 But SIG received complaints about the original trigger bar springs rubbing against the frame. If you squint and look really hard, you might be able to spot some minor wear from the spring movement in the above photo. As the title to this article suggests, the original-style West German P226 plastic grips cannot be used on a P226 that uses the updated “looped” trigger bar spring. Fitting original West German P226 grips on a pistol with a looped trigger bar spring will a) cause the spring to unhook during firing, and b) and prevent the trigger from resetting. Both of those are very bad things. You might notice that both the old and the new P226 grips have a relief cut into their undersides to allow their trigger par springs to move without interference. 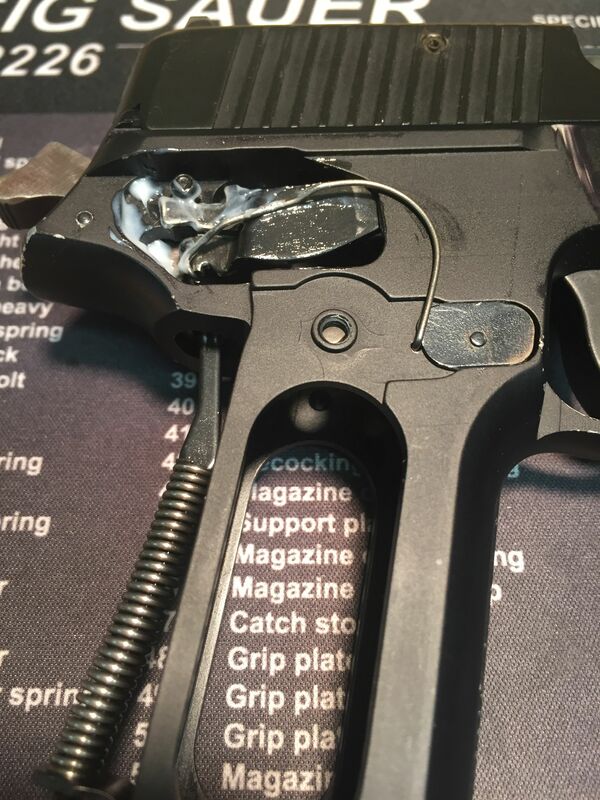 But there’s not enough relief in the original P226 grip for the looped spring, so when the old grip is installed on a gun with the newer looped spring, the old grip binds against the spring and causes a malfunction. 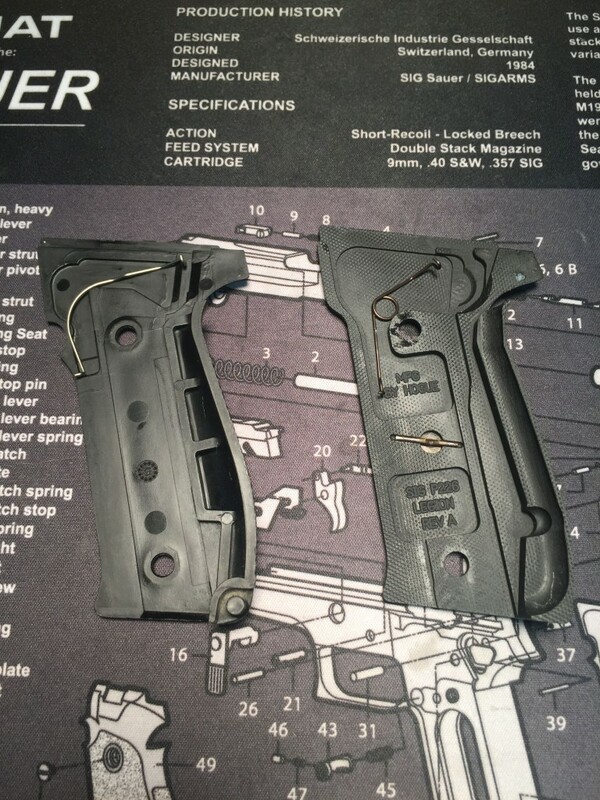 If you want to keep the original grips on your P226, you’ll either need to keep using the old-style bent springs (though they’re no longer made and keep getting harder to find), or you’ll need to do some work with your Dremel tool and gently increase the size of the relief to make room for the newer looped spring. Alternatively, you can do what many of us end up doing: install updated grips that are designed for use with the newer looped trigger bar spring. Questions, comments, feedback? Tell us in the comments below!